Definition at line 84 of file traynotify.cpp. References _dwState, _hIcon, _idx, _lastChange, NotifyIconConfig::_mode, _uCallbackMessage, _version, and NIM_AUTO. Definition at line 107 of file traynotify.cpp. References _dwState, _hIcon, NotifyIconIndex::_hWnd, _lastChange, NotifyIconConfig::_tipText, _uCallbackMessage, NotifyIconIndex::_uID, NotifyIconConfig::_windowTitle, String::assign(), COUNTOF, NotifyIconConfig::create_name(), NID_SIZE_A3, NID_SIZE_A5, NID_SIZE_A6, NID_SIZE_W3, NID_SIZE_W5, NID_SIZE_W6, and NOTIFYICON_SIZE. // NIM_ADD/MODIFY message, so we have to make a copy of it. Referenced by TrayNotifyDlg::Command(), modify(), NotifyInfo(), NotifyArea::ProcessTrayNotification(), TrayNotifyDlg::Refresh(), NotifyArea::Refresh(), and NotifyArea::UpdateIcons(). Referenced by TrayNotifyDlg::InsertItem(), modify(), and NotifyInfo(). 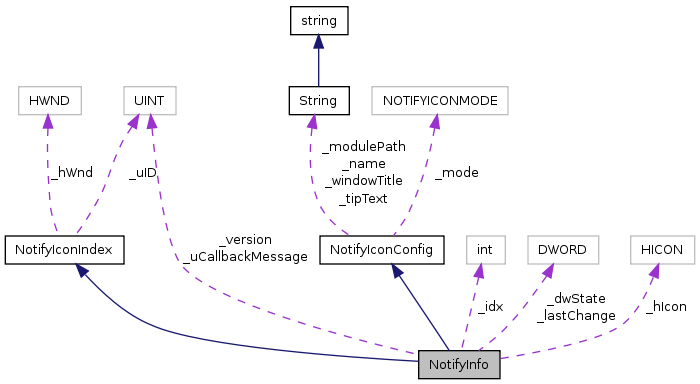 Referenced by NotifyInfo(), and NotifyArea::ProcessTrayNotification(). Referenced by modify(), NotifyInfo(), and NotifyArea::Refresh(). Referenced by modify(), NotifyInfo(), and NotifyArea::WndProc().